Condition: Embossed leather, significant wear and rubbing to spine, with bits of leather threatening to come out. No illustrated plates. Binding tight, text clean. Tokology teaches possible painless pregnancy and parturition, giving full, plain directions for the care of a woman before and after confinement The ailments of pregnancy can be prevented as well as the pains and dangers of childbirth avoided and women need not go down to death giving birth to children. This knowledge is a BOON TO EVERY WOMAN. 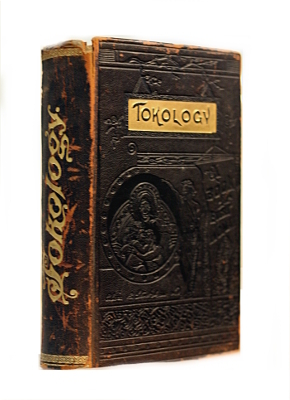 Tokology also treats upon Dyspepsia, Constipation, Headache, Neuralgia, Biliousness, etc. Physicians say that the chapter upon Constipation is the best treatise ever written upon the subject, and alone is worth the price of the book.